She had been looking all along for a friend, and it took her a while to discover that a lover was not a comrade and could never be—for a woman. Grown-up life can be rough. Raising three kids, negotiating the trials of marriage, and striving to be successful professionally leaves little room for my girls. Add in different life situations like no childcare or short bank accounts for some, and girls nights are rare in the over forty club. This is one reason I am really glad I broke off my first marriage engagement when I was twenty-one (it happened eventually) and lived a life of many girl nights and numerous girl trips. I have zero regrets, because, well, the real grown-up life is rough. Fast-forward twenty years. It pops up on Facebook that it’s one of my oldest girlfriend’s birthdays. We have not celebrated birthdays together for years. Feeling guilty about that, I send a message and say let’s go out and celebrate. I am thinking dinner someplace midway between our homes and back home by 10PM. She responds back and says let’s go see Girls Trip…at 9PM. I had forgotten it was coming out, because, well, grown-up life is rough and I thought 9PM was a joke. Two things struck me about the film beyond the nostalgia and hilarity that Regina Hall, Jada Pinkett Smith, Queen Latifah, and Tiffany Haddish bring to the film. It is no surprise that Malcolm D. Lee teamed up with Kenya Barris (Blackish) and Tracy Oliver (Barbershop) on Girls Trip. In spite of Lee claiming he does not make “black films,” the theater audiences for his cult classic Best Man (1999) and its long awaited sequel Best Man Holiday (2013) were much like the opening night audience for Girls Trip—all black (except for our Korean-American high school friend). Unlike the slave movies that often times have a larger white audience than black audience, or even Get Out, whose racial critique, for its white audience, was lost in its absurdity, Girls Trip was all about black pleasure—on and off the screen. Something that strikes me about this collaboration of black director and black writers is that the twenty-first century marks a shift in black film production. The literal ghettoization of blackness that was the hallmark of 1990s urban cinema—Boyz n the Hood, New Jack City, Menace to Society, Juice, etc.—has taken a backseat to other narratives of the black experience. More and more films are framed around friendships developed in college and professional work places rather than in urban spaces marked by economic blight. This shift has also resulted in representing black mobility. Black people are traveling. And not just in Soul Plane style. 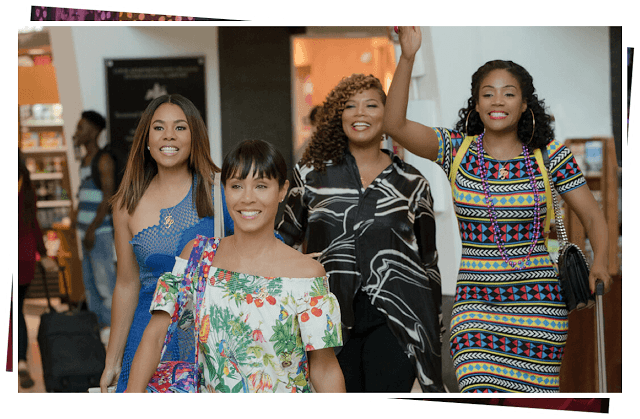 Girls Trip chronicles the reunion of four black women who had lively travel days during college—Freaknik, NBA All Stars game, etc. They meet up at the Essence Festival in New Orleans and the fun, drama, and clichéd plot line begins. But the mobility is striking. Best Man Holiday similarly was framed around a plot that relied upon mobile black folk. One thing that these narrative shifts demonstrate is there is a strong (black) market for films that focus on black pleasure narratives. Girl Trip is set to bring in $28.1M this weekend, making it the second highest grossing film this weekend and already making back the $20M it cost to make it. And, in contrast to the Tyler Perry Why Did I Get Married franchise and the Steve Harvey Think Like a Man franchises, this particular narrative disposes of the marriage plot that inundated black-cast films in the early 21st century. Marriage becomes a farce in Girls Night as it creates a space for women-centered camaraderie. Interestingly, and refreshingly, this film allowed black women to relish in the friendship and camaraderie Toni Morrison imagines for Sula and Nel, visualizing what it “we was girls together means” in a light and very real way for many black women. Thus, watching Girls Trip in a theatre full of black women was simultaneously like a flashback to watching Waiting to Exhale in 1995, but with the lived experience of not being girls together anymore but grown women who have found a moment of pleasure in spite of grown-up life being rough. Simone C. Drake is Youngberg Distinguished Professor of African American and African Studies at The Ohio State University. She is the author of When We Imagine Grace: Black Men and Subject Making by the University of Chicago Press and Critical Appropriations: African American Women and the Construction of Transnational Identity (LSU Press).